Why should you opt for Bluehost? What you get for your money you spend? Speed is an asset. Bluehost is the speedster. If you are planning to move to self-hosted WordPress website on Bluehost, this post will help you understand things you should know before moving to Bluehost. You might be hosting your website on wordpress.com, blogger or starting a blog from scratch. Irrespective of your previous plans, you have arrived here in search of Bluehost review, you’ll find that in subsequent sections (surprise at the last). Why invest in a good hosting service? A good hosting service will be fruitful from day 1. That is why it is recommended to opt for a good hosting provider. The most important thing to look for in any hosting provider is speed. How fast does the server respond to requests and hence loads the website faster. We have become impatient over the years, the average attention span has dropped to 7 seconds from 12 seconds. Hence it is very important to make your website load faster, 3 seconds to be exact. Studies show that if your website is 1 second late in loading, you would see 7% drop in conversions. 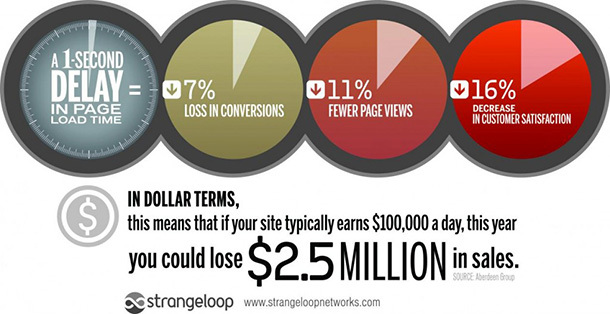 3 seconds delay would cost you over 50% of your traffic. Bluehost is recommended hosting provider by WordPress, it is trustworthy and compatible with any version of WordPress that may come in future. WordPress powers ~29% of the websites on the internet, Bluehost serves over 2 million WordPress website. There are many hosting providers out there, but only a few understand and powers WordPress like a boss. Bluehost is one of them and is quite better at it. The hosting provider provides one of the best well-managed hosting services for self-hosted WordPress. From a user-friendly panel to manage your hosting space to the one-click installation. Shared Hosting: As the name suggests, your website will reside in shared space along with other websites. Not to worry about the mixups, it will never happen. This is the best way you get started on your WordPress website. Cloud hosting: Cloud hosting allows your website to switch to other cloud servers in case of any hardware crash in the current server. This way your website will never see a downtime even in case of high traffic. WordPress Hosting: Purely made for WordPress. The servers are designed to support and run WordPress smoothly. It is optimized for best out of WordPress. One-click install makes it even more lovable. WooCommerce Hosting: Most popular e-commerce plugin for WordPress. You can host your online store built on WordPress. Just like WordPress hosting, this is purely dedicated to woocommerce. VPS Hosting: VPS (Virtual Private Server) allows you to use virtual dedicated resources in the hared environment. Dedicated Hosting: In a dedicated server, only you have space allocated for your website. In this server, no other website is hosted. A drawback is you have to manage the server on your own. Self-hosted WordPress plans on Bluehost have been engineered to manage an unlimited number of visitors. However, depending on the plan you choose, there will be an upper limit on the number of visitors per month. The highest plan in this hosting solution can manage an unlimited number of visitors per month. The Elite plan is expensive for sure but will save/get you much more than what you’ve invested. The starter plan is capable to manage a traffic of 100 million, that’s an awesome number for a newbie website. Storage is where your website elements reside on the server. Each element will be requested by the end users with all the internet protocols in place. When I was on WordPress.com, I got 13GB of space for my plan. Out of which I could only fill 34 MB after a year of blogging. So what’s included in the plan is much more than enough. In the minimum plan, you get a space of 30GB and maximum plan you get 240 GB. This number is huge for one domain to consume. One day or the other you may hit 100 million visitors mark, but it seems really difficult to consume this space completely. So in a way, you are getting an unlimited space as storage for your website. Backup and storage go nick to nick. Depending on the plan you choose, you will get an equal amount of storage and backup. The backup will safeguard your website content in case of any mishap or attack, which is a really rare thing happening on their servers. Still, to be on safer side, you get the same amount of space to take backups of your website. Your website will be automatically backed up so that your website is secure always. The Bluehost servers are to perform well even in harsh conditions. We’ve already seen the importance of speed in the beginning of this post. The speed of these servers is unprecedented, the only thing you have to do is optimize your website to speed up. Combination of both will result in a faster loading and faster conversions. You also get SSL certificate along with any plan you choose. SSL certificate is important as the latest version of browsers show “Not secure” label on non-SSL certified websites. This may prevent users from entering inputs like signups, comments, or any such entries. When it comes to performance, Bluehost is way above average. The servers have 99.9% uptime, and even if there is any downtime the site is back in action in seconds. You wouldn’t even notice the downtime. If you notice a downtime, just refresh and you will find the website back in action. Performance is a package of the hardware and software that are in use of your servers. Better the plan, better will the performance. While your website is new and growing, the minimum plan itself will prove to be enough. Once you grow, better performance is must and hence you can upgrade in few clicks. It will upgrade almost instantly and you are good to go. The response time of websites hosted on Bluehost server was exceptionally well. Here’s a test run by WPBeginner shows the Response time of their test website with a little content. Depending on your target audience you can change the server location. All web hosting companies are functioning with the end users in mind. Hence the pros and cons would also come up with features and services. Here I have listed a few Pros and cons as per my observation. Pricing: You get what you pay for. All you spend on bluhost is worth spending. The products and services that you get for the money is totally worth. Reliability: If I am the last penny down, I’d bet that on Bluehost and I know I’ll not disappoint. 2 Million websites cannot be lying on the reliability of Bluehost. Do they? Domain Price renewal price: Bluehost will charge you higher than average for free domain renewal. It kind of nullifies or covers up what you had for free for a year. CPanel: For some reason, I don’t like CPanel much, and Bluehost has CPanel as the interface between you and your server. Though it’s user-friendly, I don’t like CPanel. Bluehost can develop their own UI. The support has been exceptional so far. I needed help immediately after I started the hosting, and the help was quick and meaningful. After a long thread of emails, I got a call without requesting it from their side to resolve and better understand the issue. Get the hosting and get in touch with the dedicated team whenever stuck. You’re safe with Bluehost. In my opinion, no one in this hosting industry takes customer care this seriously as they do. AS far as quality is concerned, Bluehost server quality in huge quantity. You’d not turn back and regret upon your decision of migrating to Bluehost. If you are looking for a hassle-free web hosting service, top-notch quality of service, easy to handle, supportive, fast, secure and reliant hosting provider? Then Bluehost will not disappoint you. From a beginner to super advanced level hosting requirements, Bluehost handles it well. Though the price is bit higher side, it’s worth investing. I have been using Bluehost service for my self-hosted WordPress website for past 12 months. The support has been very helpful and the service is flawless, no downtime reported, nor any attacks. The website loads pretty fast and is reliable service. You can begin with the lowest plan and upgrade as your website grows. It will be an investment that will bring more money for further investments. Over to you. What are your views and opinions on Bluehost hosting service? Have you tried this before? Or are you planning to try in near future? Share these thoughts and answers in the comment section below. I’d love to hear from you. Do you know someone who’s looking for this information? Share this with them. Also, share this in your network.